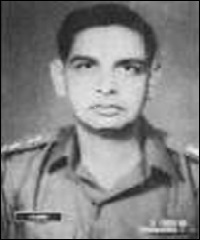 Lieutenant Colonel Ved Prakash Ghai was born on 22 February 1935 in Dehradun, Uttar Pradesh to Smt Dayawanti Ghai and Shri Desh Raj Ghai. He was commissioned in the Madras Regiment on 4th December 1954. During his service career Lt Col Ghai served in several operational areas and also got the opportunity to serve as part of Indian contingent in Congo in UN operations in 1961. In the Indo-Pak war of 1971, Lt Col Ghai’s unit was deployed in the western front and played a vital role in the battle of Basantar. During the Indo-Pak war of 1971 , Lt Col Ved Prakash Ghai was commanding 16 Madras Regiment deployed in Shakargarh sector on the western front. During the battle of Basantar river, having crossed the river and the mine obstacle in the face of heavy enemy opposition, his Battalion was occupying the bridge-head when the enemy mounted fierce counter attacks. Lieutenant Colonel Ghai rallied his men and beat off repeated enemy attacks during the night. As the day dawned, the enemy again mounted a counter attack supported by tanks. Having been under constant heavy shelling during the night, the Battalion had not completely reorganized but as soon as the main direction of the enemy attack crystallized, Lt Colonel Ghai moved to the company localities with utter disregard to his personal safety. He moved fearlessly from one position to another, directing and encouraging his men. Inspired by his personal example, bravery and leadership, the Battalion supported by tanks, repulsed the counter attacks with heavy losses to the enemy. When after stabilizing the situation, Lt Colonel Ghai was returning to his headquarters, he was seriously wounded by an enemy shell, but he continued to direct the battle neither caring for medical attention nor for personal safety. He was martyred in the the battlefield setting a fine example of military leadership , courage and supreme sacrifice. Lt Col Ved Prakash Ghai was given the nation’s second highest gallantry award “Maha Vir Chakra” for his outstanding bravery, indomitable spirit and sacrifice. During 1971 operations, Lt Col VP Ghai was commanding 16 MADRAS (Travancore). The Battalion had occupied a bridge head during Battle of Basantar in the Shakargarh Sector. The enemy launched number of fierce counter attacks to dislodge own troops. Lt Col Ghai moved to the company localities with utter disregard for his personal safety. He moved fearlessly from one position to another, directing, encouraging and enthusing his men. Inspired by his personal example of bravery and leadership, the Battalion repulsed the counter attack with heavy losses to the enemy. He was seriously wounded by an enemy shell, but he continued to direct the battle, neither caring for his personal safety nor for medical attention. He died of his wounds on the battlefield, thus making the supreme sacrifice of his life. For displaying outstanding gallantry, fearless courage and great devotion to duty, with utter disregard for his personal safety in the face of the enemy, Lt Col Ved Prakash Ghai was posthumously awarded the Maha Vir Chakra. Salute to our brave soldiers. I salute the service to the country and the supreme sacrifice. Salute to Lt Col for his bravery and sacrifice.